Photo challenge: find beauty in something broken. 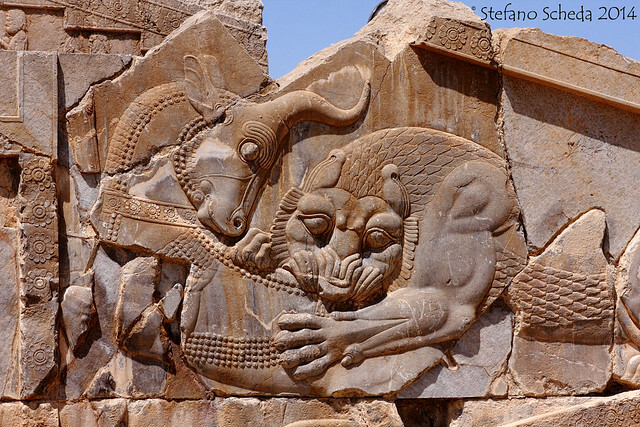 Bas-relief of lion and bull combat, Palace of Darius – Persepolis, Iran. Yes, since about 2500 years! The Moon fighting the Sun 🙂 I’m trying to figure out the scale of this. Beautiful shot, Stefano. This is the sort of thing I love to see, in person or in photos. Yes, Persepolis is quite in the center of Iran, so it has. A very vibrant and lively image, even after 2500 years. Very lively. All the palaces in the site have many stunning, wonderful bas-reliefs. Perfectly photographed – your skills match the exciting places you travel to.